Potassium niobate crystals dopped with Fe, Ni, Cu, Ce, Rh and Co were grown in order to optimize the photorefractive response over an extended spectral range. Extrinsic properties important for the photorefractive effect: absorption, and two- beam coupling, are discussed. Modification of the charge transport parameters in order to improve the response time of photoiduced refractive index changes is obtained by means of post growth annealing at temperatures of 400-900 °C in a controlled atmosphere. We examine novel applications of photorefractive KNbO3:Fe in hexagonal array generation, edge enhancement and image broadcasting. Edge enhancement, as well as phase conjugation, is readily achieved using a two beam coupling geometry. Pertinent theories are also discussed, especially, the instability criteria leading to hexagon generation, assuming transmission and reflection gratings. Photorefractive holographic recording at 780 nm in Bi12SiO20 which exhibits dual,dynamic and semipermanent, behaviour is investigated. The semipermanent holograms present very long decay times (up to 3600 sec) for relatively high reading and consequently erasing beam intensities. Experimental investigation of this behavior is performed and comparison with theoretical results is made. Finally, image processing applications, such as addition and subtraction of images and incoherent-to-coherent information transfer, utilizing this dual recording character as well as the special properties of the material, are presented. Photo-induced effective nonlinearity, n2, of a BSO crystal is measured by using a Z-scan method which is based on self-focusing/defocusing effect. The Z-scan technique is an simple yet accurate way to measure, n2. An optical limiter utilizing the photo-induced lensing is investigated and the influences of spatial self phase modulation for strong CW illumination is presented. 1. Kawata Y, Kawata S, Minami S, J Opt Soc, Am B,7(1990)2362-2368. 2. Bairamov B K, Zakharchenya B P, Khashkhozhev Z M, Sov Physics-Solid State, 14(1973)2357-2362. 3. Sheik-Bahae M, Said A A, Wei T H, Hagan D J,Van Stryland E W, IEEE J Quantum Electronics, 26(1990)760-769. 4. Sheik-Bahae M, Said A A, Wei T H, Hagan D J,Soileau M J, Van Stryland E W,Opt Eng, 30(1991)1228-1235. 5. Banerjee P P, Misra R M, Maghraoui M, J Opt Soc, Am B, 8(1991)1072-1080. 6. Song Q W, Zhang C, Gross R, Birge R, Opt Lett, 18(1993)775-777. 7. Tanguay A R (Jr), Ph D Dissertation, 1977, Yale University, pp64-73. 8. Durbin S D, Arakelian S M,Shen Y R,Opt Lett, 6(1981)411-413. Potential applications of photorefractive ring resonators in optical computing are reviewed. Using an electronics-like point of view of photorefractive optical circuits, we propose a model of an optical transistor based on the operation of photorefractive ring oscillators. Both unidirectional and bidirectional rings are considered as models for different optical logic gates. We also discuss applications such as optical amplification, polarisation rotation and switiching. We comment on the advantages and disadvantages that such arrangements offer. The role of transverse effects and instabilities in the operation of these devices is discussed briefly. In this paper, the angular and the wavelength selectivities of a multiplexed fiber hologram, using couple theory, are evaluated. We have shown that the reflective-type fiber hologram has a uniform and a higher wavelength sensitivity than the transmission type. Cross-talk noise among the multiplexed channels and the recording-erasure dynamics in a fiber hologram are also calculated, in which we have shown that the wavelength-multiplex reflection-type fiber hologram would be the best choice for high density data storage. Experiments to demonstrate the feasibility are also provided. 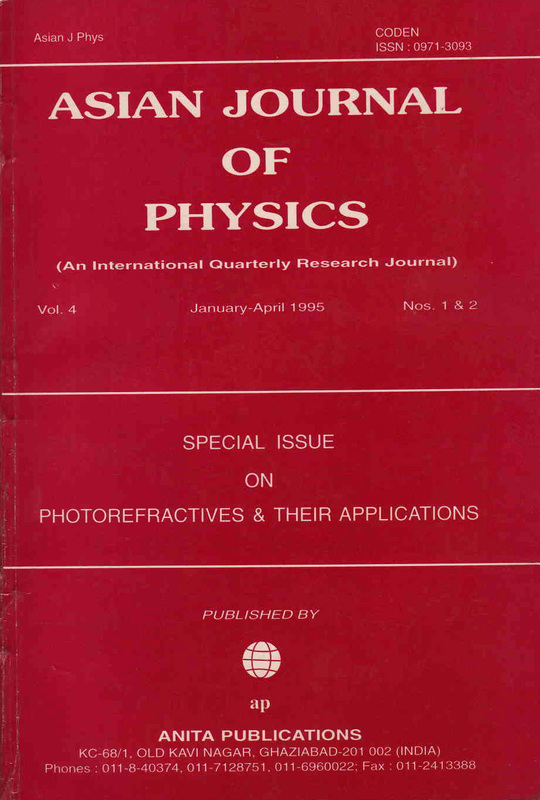 Photorefractive materials and their applications: A bibliographic review for the year 1994. Ever since the discovery of photorefractive (PR effect), phenomenal progress in this field has been achieved through sustained research and development efforts. The PR materials have been the stepping stone to the successful demonstration of many applications in optical computing, and image processing, holographic interferometry, holographic associative memories, neural networks, and phase locking of lasers etc. Theories have been formulated which reveal and scrutinize many new and prospective aspects of the PR process not yet explored. The study with its scientific maturity pervades many scientific disciplines, including numerical analysis, crystal growth, solid state physics, material characterization, nonlinear optics, real time optical image processing, holography and robotic vision etc. The present article furnishes a qualitative review along with a comprehensive listing of various articles that have appeared on the subject in the year 1994. We hope that this literature survey will provide help to the researchers in the field to keep themselves abreast of the recent progress. The contents of the article have been broadly subdivided into four sections: PR processes, materials, devices and applications.. Although, this article is dedicated to the PR materials and associated phenomena, for the sake of completeness, we have included few articles on phase conjugation obtained in materials such as dyes, saturated laser gain media, and liquid crystals etc. We do not claim the listing of the articles to be complete and would welcome any suggestions as to the addition of missing references.